Providence Christian denied Blessed Trinity the title in last year's Perfect Game High School Showdown at Lake Point Park in Emerson, Ga. In the 2018 edition, Blessed Trinity got even. The Titans seized control late and went on to beat Providence Christian (Fla.) 11-8 to win the Red Division title in one of the country's more-prestigious high school tournaments. Montverde Academy won the Blue Division title after defeating Houston County 6-2. Blessed Trinity improved to 12-1 on the season after going 4-0 in tournament play. The Titans defeated state powers Brookwood, Buford and Parkview before outlasting Providence. 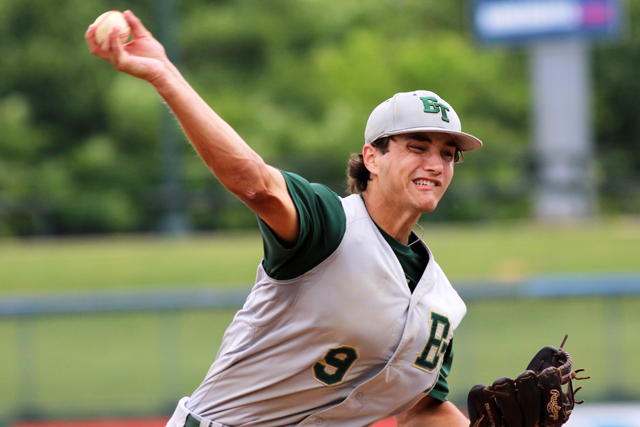 “These guys are just resilient,” Blessed Trinity head coach Andy Harlin told perfectgame.org. “We graduated nine seniors who played a lot last year, so starting the season out, there were just a lot of new guys in new roles, and that kind of thing. Junior Jake Smith went 7-for-12 at the plate with a double, triple and five RBIs in Blessed Trinity's four victories. He also took home the MVP award. Some information from perfectgame.org was used in this article.